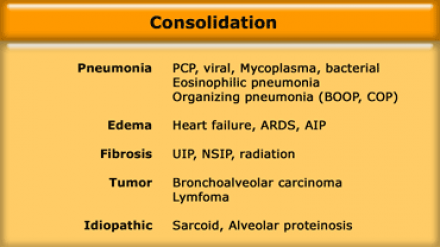 In consolidation, there is exclusively air left intrabronchial. This is called the 'air bronchogram'. 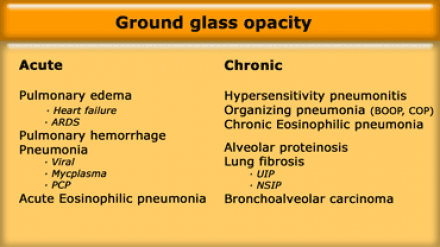 Upper zone predominance: Respiratory bronchiolitis, PCP. Thus ground glass in itself is very unspecific. 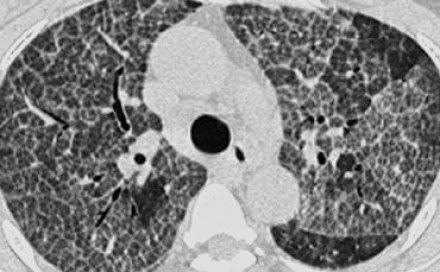 Here we see consolidation and ground-glass opacity in a patient with persistent chest abnormalities and weight loss without signs of infection. 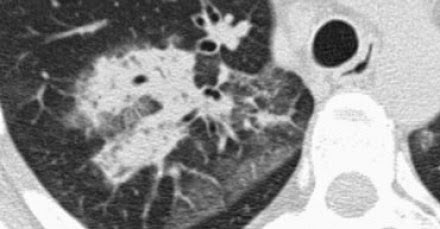 Ground-glass opacity is nonspecific, but highly significant finding since 60-80% of patients with ground-glass opacity on HRCT have an active and potentially treatable lung disease. 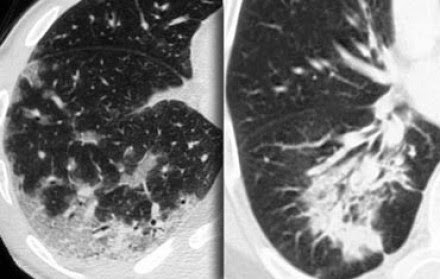 Here are two cases with GGO, one without fibrosis and potentially treatable and the other with traction bronchiectasis indicating fibrosis. 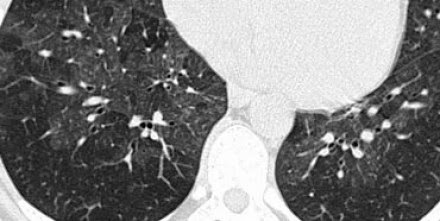 Here is a CT with GGO as dominant pattern. NSIP has a relative good prognosis and the majority of patients respond to treatment with corticosteroids. This outcome is quite different from that seen in UIP, which has a poor prognosis. 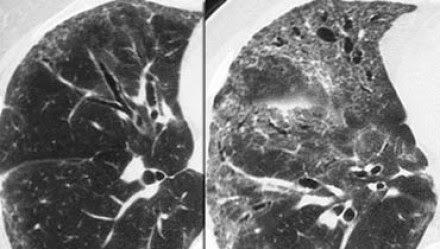 The term 'mosaic attenuation' is used to describe density differences between affected and non-affected lung areas. HRCT of a patient with ground glass pattern in a mosaic distribution. · Hypersensitivity pneumonitis (HP) is an allergic lung disease caused by the inhalation of antigens contained in a variety of organic dusts. Farmer's lung is the best-known HP syndrome and results from the inhalation of fungal organisms that grow in moist hay or exposure to birds as pets . Above is a patient with ground glass pattern in a mosaic distribution. CT of another patient with ground glass pattern in a mosaic distribution. Is it pus, edema, blood or tumor cells (Table above). Here are two cases with chronic consolidation. 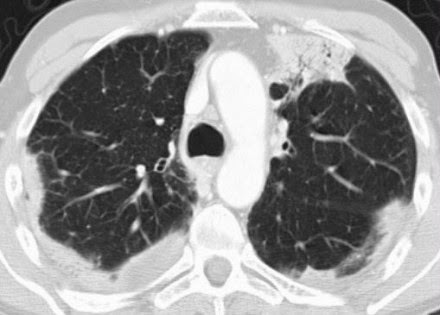 Seen here is a case of chronic eosinophilic pneumonia.